Supernodulation in soybean (Glycine max L. Merr.) is an important source of nitrogen supply to subterranean ecological systems. Single nucleotide-amplified polymorphism (SNAP) markers for supernodulation should allow rapid screening of the trait in early growth stages, without the need for inoculation and phenotyping. The gene GmNARK (Glycine max nodule autoregulation receptor kinase), controlling autoregulation of nodulation, was found to have a single nucleotide polymorphism (SNP) between the wild-type cultivar Sinpaldalkong 2 and its supernodulating mutant, SS2-2. Transversion of A to T at the 959-bp position of the GmNARK sequence results in a change of lysine (AAG) to a stop codon (TAG), thus terminating its translation in SS2-2. Based on the identified SNP in GmNARK, five primer pairs specific to each allele were designed using the WebSnaper program to develop a SNAP marker for supernodulation. One A-specific primer pair produced a band present in only Sinpaldalkong 2, while two T-specific pairs showed a band in only SS2-2. Both complementary PCRs, using each allele-specific primer pair were performed to genotype supernodulation against F2 progeny of Sinpaldalkong 2 × SS2-2. 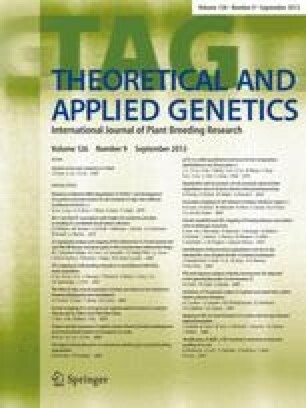 Among 28 individuals with the normal phenotype, eight individuals having only the A-allele-specific band were homozygous and normal, while 20 individuals were found to be heterozygous at the SNP having both A and T bands. Twelve supernodulating individuals showed only the band specific to the T allele. This SNAP marker for supernodulation could easily be analyzed through simple PCR and agarose gel electrophoresis. Therefore, use of this SNAP marker might be faster, cheaper, and more reproducible than using other genotyping methods, such as a cleaved amplified polymorphic sequence marker, which demand of restriction enzymes. This research was also supported by a grant (code no. CG3121) from Crop Functional Genomic Center of the 21st Century Frontier Research Program funded by the Ministry of Science and Technology (MOST) and Rural Development Administration (RDA) of the Republic of Korea. We also thank the National Instrumentation Center for Environmental Management at Seoul National University in Korea, and the International Atomic Energy Agency in Austria.